Whilst the origins of this ancient custom are lost in the mists of time, the tradition is maintained by local voluntary effort. Each Hogmanay as midnight is announced by the bells of Big Ben the Flambeaux are lit. 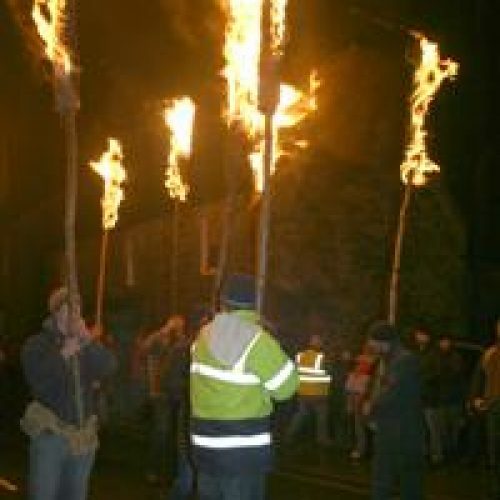 The torches, consisting of long thick birch poles with tarred rags tightly bound to the tops, are paraded around the village preceeded by the pipe band and followed by a fancy dress parade. Once the procession returns to Melville Square prizes are presented to the best Fancy Dress competitors and then the torches are cast over the Dalginross Bridge into the waters of the River Earn. This is supposed to signify the casting out of evil spirits. Many of the villagers follow this on with the custom of ‘First Footing’ which usually involves a dfferent type of spirit entirely! This year there is a new shield to present to the best adult single /pair entry, The Jimmy Stewart Shield. 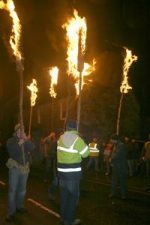 Thereafter the main parade will commence with the lighting of the Flambeaux at midnight and setting off from Melville Square on the usual route round the village. We encourage folks to dress up to join the parade with topical Fancy Dress and small scale floats or carrying items to show off their fancy dress. There is a new shield to win this year (The Jimmy Stewart Sheild). This event has changed little for as long as anyone can remember. There have been small changes due policing and health and safety issues and also the fireworks are relatively new, but we do try to keep it as traditional as possible. The Flambeaux Committee hope this is of help to you and that you will be joining with us in the Hogmanay celebrations.